It’s typical of the inclusive humility of the man. “I’m just the conduit for the music of Africa”, he’d said earlier, declaring that his classic song Stimela – depicting the train that carried African men to the mining industry, often a very long way from their families – had just come to him one evening, finished and ready to play. I was late coming into the orbit of Hugh Masekela, the towering bandleader, composer, singer, trumpeter and flugelhornist. It was his 1987 release Bring Him Back Home – “Bring back Nelson Mandela, bring him back home to Soweto” – that made me realise he was a force to be reckoned with, both as a fine Afro-Jazz musician and as a fearless campaigner for equal rights for African people. His defiant campaigning saw him exiled for three decades, but it also led to him studying at the Manhattan School of Music, and at the feet of such greats as Miles Davis, John Coltrane, Thelonious Monk, Charlie Mingus, Dizzy Gillespie and Louis Armstrong. 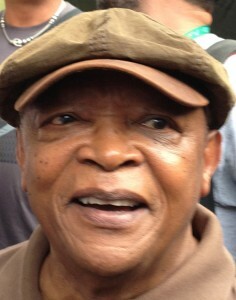 In 1990, following the release of Nelson Mandela and the unbanning of the African National Congress, Masekela returned to Africa. He’s lived in many different communities, including in Zimbabwe and Ghana. It’s reflected in the diverse musical cultures that he’s absorbed. Whilst in exile in the US, Bra Hugh – as he is affectionately known – worked hard to retain his African language skills: “I used to have a place in Central Park where I would go to talk to my imaginary friends. I was terrified that I was going to lose my language. So I would go there and I would start to speak in Sotho first, and I would change from that to Zulu and then to Xhosa, and then I would go into tsotsi Afrikaans.” On one occasion a policeman – concerned by the sight of Masekela muttering to himself in Central Park – went over to him to see if he needed help. In typical Bra Hugh style they became long-term friends. “My biggest obsession now is to show Africans and the world who the people of Africa really are” Masekela says, something that is reflected in his latest project, the Hugh Masekela Heritage Festival, which he hopes will grow into a tour through the townships, with workshops for the next generation of musicians. He’d no doubt be pleased to see that on the program for WOMADelaide in March is the young Zimbabwean band Mokoomba, who’ve been referred to as “the future of African music”. 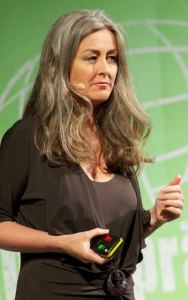 I’m also very much looking forward to inspirational speaker Polly Higgins, who will be appearing as part of WOMADelaide’s The Planet Talks series. In 2010 we featured an interview with Polly about her campaign to put environmental villains in the dock for the crime of ecocide. It will be great to get an update from her. This entry was posted in Activism, Culture, Environment, World Music and tagged activism, ecocide, education, Hugh Masekela, Polly Higgins, WOMADelaide, world music by Brian Loffler. Bookmark the permalink.